Thanks again to Regular Reader for this scan. This entry was posted in Abuse of power, Child Protection, Child Sexual Abuse, Greedy Councillors, Greedy Piggies, Jahangir Akhtar, Mahroof Hussain and tagged child sexual exploitation, Emma Hoddinott, Jahangir Akhtar, Labour Chicanery, Mahroof Hussain, Paul Lakin, RMBC, Rotherham Metropolitan Borough Council, Scum Labour, Shaukat Ali by Rik. Bookmark the permalink. 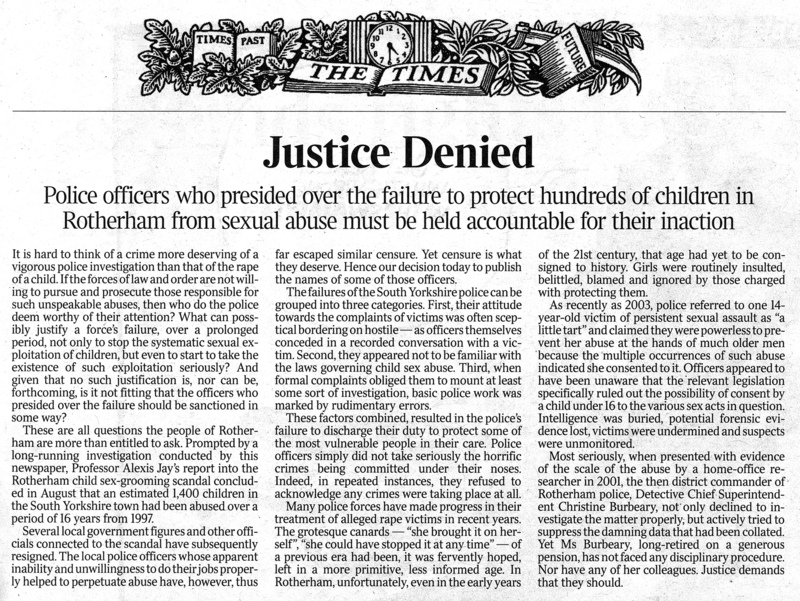 There`s one thing for certain the Times coverage of this scandal is not going to go away, hopefully it will help bring the perpetrators to justice. Labour are a spent force, not only have they walked away from their traditional core vote they along with South Yorkshire police walked away from the victims. As the findings of the various investigations are made public the anger directed towards Labour elected officials will increase, I fully expect that Labour will lose further Cllr`s next year and even the possibility of a sitting MP. World class investigative reporting by Andrew Norfolk and his colleague, keep it up! I’ll tell you another thing for certain. Sooner or later this blog will be closed down for copyright infringement. ‘ Sooner or later this blog will be closed down for copyright infringement’. Your evidence for such a bold and ridiculous statement? Provided a blogger acknowledges the source of any information taken and/or copied from another site/broadcaster or newspaper there is no	infringement. you upset too many people !!! you should be more careful !!! you have an Achilles heel !!! Bit of ‘over interpretation’ here I think? This is WordPresses disclaimer, not legal guidance for users. Significant jurisdictional issues would also serve to complicate matters, if action were to be contemplated? For readers information, I believe I have sufficient permission for my actions, viz a viz the Times, so I cannot see a problem there. Seems you have let your mask slip with your final points, I believe? Don’t let emotion cloud your judgement, I assume you are one of those Rothpol has upset, and you will be upset some more as more of the truth about the misconduct, malfeasance and misfeasance at the top of Rotherham Council is exposed! Norfolk is another grief vulture reporter for a horrible rag.every dog has his day and norfolk and the times are having theres.half truths half bull as usual.what about such passionate reporting for the govt pedos covering their behinds or the online pedos who apparently cannot be prosecuted? All should be rightly punished. Now I understand why a senior police officer gave a Labour politician of Pakistani origin a character reference following a violent assault incident. The prevailing culture at the time was to ignore the victims and support the perpetrators of child abuse and an individual charged with a violent attack. Is the above post regarding copyright an attempt to gag Rothpol? Looks like a veiled threat to me, no doubt an individual with a background in supporting Rotherham Labour, the police and criminals who abuse children. The Times Leader gets it right; its what I experienced. I couldn’t have explained it better myself. While politicians of all hues may try to score political points – as politicians do – Mr Norfolk is quite rightly also simply shining the spotlight on a very major player in the CSE Scandal – and in my opinion the central player; namely some Senior Officers, and some, but in no way all, front line officers at SYP. I mean come on what’ s the point in removing some from elected office if those that played a major role in the scandal – some Senior SYP Officers and RMBC unelected officials go scot free and remain in post? Absolutely none at all. Mr Norfolk is doing an excellent job – he isn’t scapegoating or seeking cheap headlines – he is simply following the line of inquiry as all with influence should. In a way Bernard is correct – the media should also be concentrating on ‘similar events within WC1’ – and not all in the media cover the story for the right reasons or well; as the recent documentary on Harringey showed. However, people such as Andrew Norfolk and the BBC’s Ed Thomas for instance can not be classified as grief monkeys. They are simply excellent dedicated professional journalist working all the hours and more so they can try to expose the scandal in full – not just in Rotherham but elsewhere; and for that they deserve all the praise they get – indeed I would argue more and the nation’s eternal thanks. As with local politicians, not all the police were involved; it would be wrong to say so. But like with politicians and senor non elected officials at RMBC, those involved at SYP should be made to answer for their actions. The victims deserve that, the citizens of South Yorkshire deserve that and also the Police Officers and staff at SYP who had nothing to do with it deserve that too. As for someone suggesting RothPol could be closed down for using other links links; they’d have to close down 99.9% of all blogs and even commercial sites if that is the case. Is it someone with a vested interest, or even the SYP? I think not. Its probably just an opinion but sh e/ she shouldn’t worry it won’t happen. Still if it was the case I mean come on someone would just start it all up again – even me LOL. Message to Anon – issues and views don’t go away by such threats to a blog. They only add to the scandal. Some may never understand but It’s always the cover ups that gets them (whoever they are ) in the end. The usage is almost certainly covered by the concept of “fair Dealing” introduced in the The Copyright and Rights in Performances (Quotation and Parody) Regulations 2014, but in any case the the only legal complainant would be the Times. I think the Times will support us on this RR.